So the other day in Umeda, I went to tower records and it was awesome! I need to go back to get some pictures of the actual store (and spend all of my scholarship money on CDs...). It's so amazing there! First up, I bought Crossfaith's new album: "Xeno"
I've written before about Crossfaith, and they are one of my all time favourite bands. Picking up Xeno was the main purpose of my Tower Records excursion. I was super excited about Xeno, because the quality of the singles they have released from Xeno has been so good! The singles they released in the lead up to Xeno's release on the 18th were "Xeno", "ghost in the mirror" and "devils party". They also streamed the whole album on YouTube but I didn't want to spoil it for myself before I went out and bought it. I just like CDs ok? So, did Xeno live up to my overexcited hype? Yes. Yes it does. It is basically everything I wanted from a Crossfaith album. Fast paced, exciting metal core that I have been listening to non stop since I bought it. There are 12 tracks, including a collaboration with Benji Webbe from Skindred on "Wildfire". The album has a mix of high energy tracks like "Devils party" with a few slower ones like "calm the storm" and the final track "astral heaven". But they are mostly fast paced, upbeat tracks that make you want to jump around and scream the lyrics back to them at a concert. Crossfaith are amazing live (I saw Crossfaith at Manchester Academy 2 in November) and I can't wait to see them play on their home turf. Luckily for my UK friends, Crossfaith love playing abroad, and this year will see them playing another UK tour that includes my local venue, Leeds University Union!!! 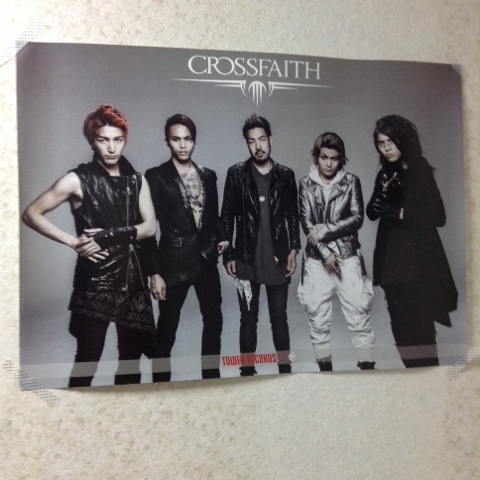 Crossfaith why u play Leeds when I'm in Japan ahahah. I'd recommend this album to anyone! It is just as good as their last album, Apocalyse, and there isn't a weak track on the album. Definitely one of my favourites this year. I love Tower Records, A lot.